AN award-winning North-east fish and chip shop is set to cook up a storm across the globe following a visit yesterday (11 March) from some Japanese businesspeople keen to introduce the fish and chip culture to their country. 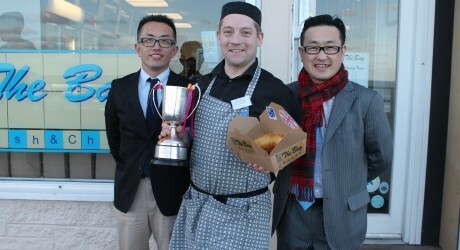 Says a spokesperson: “Award-winning chippy, The Bay Fish and Chips of Stonehaven, has been approached by a high-end Japanese department store chain to take part in its annual British fair to introduce the British traditional dish to the Japanese market. “Hankyu Hanshin Department Stores Incorporated, which is a subsidiary of the stock holding company, H2O Retailing Corporation, own two large department store chains Hankyu Stores and Hanshin Stores. The trip to Japan will include two weeks split between one Hankyu and one Hanshin store cooking up the fish and chip storm for the customers to sample whilst teaching the kitchen staff at the stores how to cook the dish. Project and Business Development Executive for Hankyu Hanshin Express (UK), Keiji Hayashi, said: “This year’s fair will be the 45th fair we have held and we are eager each year to introduce British fair to the Japanese. Owner of The Bay, Calum Richardson, said: “I am overwhelmed at the opportunity that I have been approached to take part in. “To represent the classic British dish to the Japanese is an honour and I am sure I will be able to give the dish justice across seas. The Bay is a multi award-winning fish and chip shop which has a drive and passion for the environment, sustainability and local produce. The shop is run by husband and wife team, Calum and Lindsay Richardson, who both drive the shops values. The shop has a three star rating from the Sustainable Restaurant Association (SRA) and were the first fish and chip shop to be granted MSC (Marine Stewardship Council) chain of custody for its North Sea haddock, which gives the firm total control of its traceability of its fish produce.